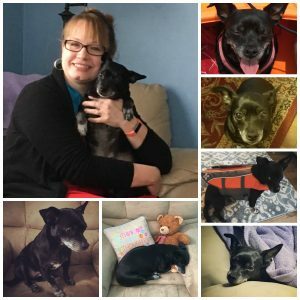 Hug Your Hound Day is an unofficial holiday created by behaviorist Ami Moore to encourage dog owners to provide the best mental and physical care for their pooches. Dog lovers don’t need a specific day to snuggle up with their furry friends. I wasn’t always a dog lover. I liked dogs, but it wasn’t until I got Penny, my chihuahua-mix, that I realized the depth of my canine compassion. Our youngest son had gone off to college, and I struggled with empty nest syndrome. Also, I was writing my fourth novel, Lakeside Redemption, at the time and had been doing a lot of research on dogs and canine handlers. I told Hubby we needed a dog. My mom had adopted Penny from a local animal shelter, but after several months, she wasn’t able to keep Penny in her apartment due to Penny’s dislike of other dogs in the building. I had cared for Penny while my mom was in the hospital and having to give her back broke my heart. So when Mom called and asked if I could take her, I couldn’t say yes fast enough. She’s been my sidekick for the past three years. 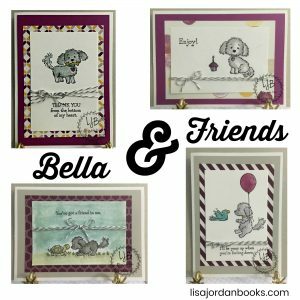 In honor of canines, I created a set of 8 cards using the Bella & Friends stamp set from Stampin’ Up! layered on Moonlight Designer Series Paper (retired) and Michael’s Recollections paper for the solid base layers. I used Stampin’ Up! Lost Lagoon, Blackberry Bliss, Hello Honey, and Basic Gray inks along with Basic Gray baker’s twine. Recently I read Sit, Stay, Love by Dana Mentink and absolutely loved it. A charming book with a sweet romance and an adorable rascal of a dog named Tippy. I was thrilled to see she had other books in the series: Fetching Sweetness, Paws for Love, and a free novella, Love at First Bark. So, if you love dogs, consider buying this series. To celebrate Hug a Hound Day and our precious pooches, I’m giving away the set of 8 Bella & Friends cards and a surprise treat for your favorite dog to one subscriber from my newsletter mailing list. If you would like to participate in the giveaway, you can sign up here: HUG A HOUND DAY GIVEAWAY. I’ll announce the winner next Wednesday on my Facebook Author Page. Celebrate National Read a Book Day with Cards & a Giveaway! I love to read! How about you? In fact, my love of reading led to my desire to become a writer. One author’s words changed my life. But reading and writing aren’t my only loves. I’m a creative who loves to play with words, photos (scrapbooking), and fibers–paper and yarn. Crafting is my therapy. Cheaper than a weekly visit to a counselor, and a lot healthier than chocolate…although, chocolate is involved when I’m crafting with friends. As someone who loves books, words, and paper, I figured the best way to celebrate National Read a Book Day was by stamping a set of cards. I was inspired by cards I’d found on Pinterest that led me to Pink Paper Bakery. Using her card as inspiration, I dug through my box of scraps (filed by color in a photo box from Michael’s) and pulled out five coordinating papers in 8 color families to make this set of 8 cards. I used white cardstock cut at 8.5″x 5.5″ and folded as my base and then I added a cream-colored layer cut at 5.25″x4″. 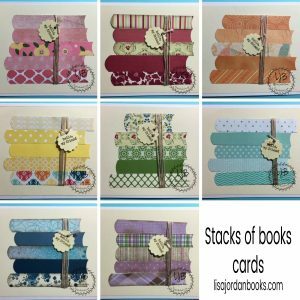 Each stack of books is bound together and tied with a tag that reads, “hello, my friend” from the Stampin’ Up! Tap Tap Tap stamp set. If you would like complete instructions on how to create these cards, contact me and I’ll send you the PDF tutorial. Single mom Carly Wagner is surprised to learn she’ll have to share ownership of the home she’s inherited with her first love—and first heartbreak—Andrew Stephens. 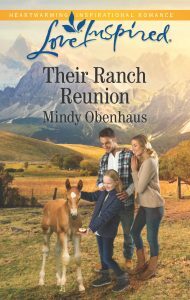 The man who fled their tiny Western town is back and standing in the way of her dreams to expand her B and B. Now a successful businessman, Andrew has eight weeks to buy Carly out. But Carly’s too stubborn to persuade—and too beautiful to ignore. When fire ravages her inn and she and her daughter move into their shared property, Andrew’s in over his head. Time is running out and Andrew must decide: leave and chase another deal…or stay and chase Carly’s heart. To help you celebrate National Read a Book Day, I’m giving away this set of 8 cards and a $10 Amazon gift card to one reader! This contest is open to US residents only, and it ends at 11:59 pm on Tuesday, September 12, 2017. To enter the giveaway, click here to sign up: ENTER NATIONAL READ A BOOK GIVEAWAY. The winner will be announced on my Facebook Author Page next Wednesday.